David Rhodes – the name is a shorthand for Peter Gabriel's guitar, for an important part in Gabriel's musical work. The more reason to take a closer look at this artist and his current album Bittersweet. Sixteen years later we can finally listen to the album – a long time even when you compare it to Peter Gabriel's release cycles. The album is called Bittersweet. It is not available in stores [update June 2010, see below!] but only as a download for which you have to become a member of the Bowers & Wilkins Society Of Sound. Sounds complicated? It is. But since this was apparently the only way to put the album out at all fans can take up the offer or hope for a regular CD release. B&W offer the album in several high-quality audio formats and provide cover artwork. And Down By The River is one of the ten songs we can finally listen to after it has matured for sixteen years. 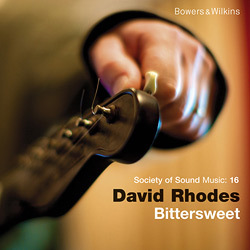 David is not the kind of musician who enjoys the limelight; accordingly there is no portrait of him in the album artwork but only a snapshot that shows him tuning his guitar. The B&W homepage addas a couple of other snapshots from the recording sessions, no further photos. The album credits list well-known names and place: Recordings took place at Gabriel's Real World studios and the album was released through Real Worls Music Ltd. David co-produced the songs with Richard Evans who he has been working with for several years on several projects. Ged Lynch, another member of Gabriel's band, plays the drums. Other musicians are less connected to Peter Gabriel: Dan Brodrick (keyboards), Charlies Jones (bass, played for Robert Plant and Goldfrapp), the Tosca String Quartet. Peter Hamill did backing vocals for one song. Guitars and vocals are provided by David Rhodes himself, of course. But now let us turn to the ten songs on Bittersweet, and to my subjective impressions. I have been a huge fan of David's work since the early '90s, and I have tried to buy everything he has worked on. It is quite likely that I was one of the first people who downloaded the album when it was released on August 25, 2009. It is therefore very difficult for me to be objective. The album begins unexpectedly with a brief string intro before David's famous guitar sound and his occasionally fragile vocals build into what I would call a typical Rhodes song. Reality Slips is not one of his usual ballads like the old version of Down By The River or his songs on Snowflake – this one here turns into real rock with lots of power, a crisp instrumental part with sharp guitar riffs and thumping drums. And all the while the string bit from the beginning continues. The speed is rather slow which reminds me of certain Gabriel songs. Some of the sounds and melodies seem oddly familiar, too. Perhaps it is just my imagination, but it may well be that Peter and David's styles have blended after working together for all these years. A fine opening song that lives up to my expectations. First impression: Oh, this is quite different from the Plus From Us version – that one was more balladesque and melodious. The new version begins with a very minimalistic verse and chorus part in which guitar and vocals are the leading elements. The song begins to build up from that. Drums and bass speed it up while the sparsely arranged chorus brakes it again. A couple of gruff guitar bits and some weird sounds (quiet humming and crackling – a flaw in the production?) are added to the middle verses. The songs ends very feelingly with repetitions of the chorus that slowly fades away to its instrumental end. The original of this song is my benchmark for how „Rhodes-style“ a song is, which explains the high marks in this category. David has obviously changed in the last sixteen years; his style is much more modern than 1993. The music speeds up and the style changes, becomes even more modern. 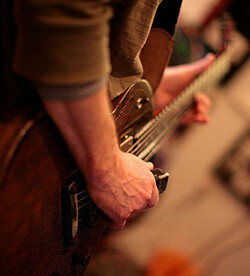 A slow dancefloor beat and calm vocals lead into Just Two People, but are soon covered by faster rock sounds. The major difference to the first two songs is David's voice. He sounds more aggressive, particularly in the chorus. It reminds me of the former band Random Hold where David sang in a similar way. But these are not the early 80s and it is therefore no surprise that David sounds like a modernized version of his ex-band. There are a couple of unusual sounds in this piece. One of them reminds me of the „elephant sound“ in Genesis' No Son Of Mine. After a very fast, rocking middle section the song ends with a long, grooving instrumental complete with violins, a keyboard and guitar wall of sound and the beat from the beginning. Here it is again, the typical Rhodes sound from, say, Snowflake. David goes the rock way here (as in Reality Slips). The songs are kind of similar in a general way. Crazy Jane is perhaps a bit more melodious. The song works well for David's voice that sounds very good here as in all the quieter songs. David briefly takes the speed and volume out of the piece halfway through the mid-tempo song. Crazy Jane ends as melodious as it began, with a longer repetitive chorus of „ooohooo“s that had already occured before in the chorus. Crazy Jane's final „oohooo“ has barely faded away as a pleasant guitar loop / drum beat mix begins that goes all the way through All I Know. I am not sure where to place this song. David does not sound the way I know him here, a bit like Random Hold, yet different. The song is very rocky again and sounds very „modern“, whatever that may be. 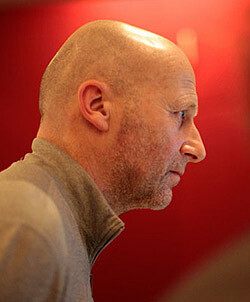 His voice and the style of the song remind me of – Simon Collins (!). Perhaps I should listen to music that does not come from the Genesis camp for a change. The defining bits in All I Know are a slow rhythm and the various guitar sounds woven into it. With the monster gone the mood improves right away. The chorus reminds us that There's A Fine Line between happy and sad. Melodious Hammond organ, rough guitars and a full-bodies drumkit make this a catchy mid-tempo tune. David's voice moves between Random Hold and the Snowflake songs. The outcome is not necessarily the highlight of the album, but by no means a failure. The final song on the album is the one that is closest to David's calm pieces on, say, Head, Hands And Feet or Snowflake. A little bit of piano from the right speaker, some guitar from the left, David's quiet and emotional vocals in the middle – add to that some strings and backing vocals and you have a touching song that would have been good on a Peter Gabriel album, too. It is a gentle ending to a varied album. Bittersweet has only few weaker moments but lots of really good songs, some familiar elements and many surprises. If you are a Rhodes fan you need this album, and if you liked the Random Hold albums, David's songs on Head, Hands And Feet, on Snowflake and his work for Peter Gabriel you will enjoy Bittersweet. 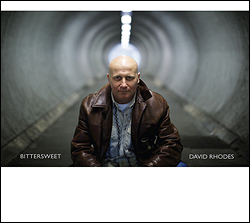 I cannot tell what effect the album may have on unbiased listeners, but it certainly has the potential to attract new David Rhodes fans. It was well worth waiting for, and we may hope that Bittersweet will be released on CD one day and that David does not wait another sixteen years to publish new songs. Bittersweet was released on CD now. The german C.A.R.E. Music Group made it available just in time for David's european tour in May (official release date was 4th June 2010). While the music is the same as the B&W download, the album got a complete new cover artwork. A booklet is missing, but all relevant information is listed inside the digipak. The CD is available at the German amazon department.